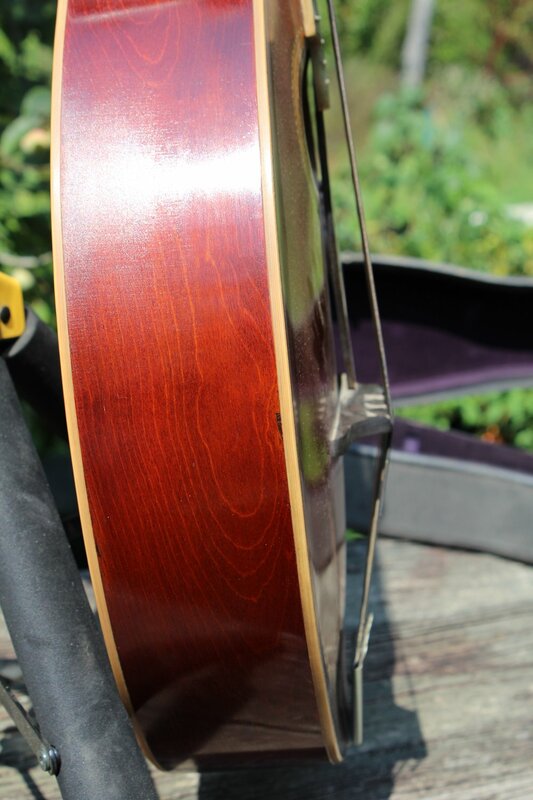 Near mint 1913 Gibson K-2 mando-cello serial number 22800, FON 2230. What an amazing opportunity! Imagine it is 1915, and you are turning to the page of a Gibson catalog where you see the drawing and description of the K2 mando-cello (catalog photo shown above). There is a moment when your heart races, you think dare I? and then you place your order. What comes in at the train station is a gleaming brand-new red sunburst mando-cello ready for you to enjoy wonderful sound and fun playing. Now, you do not have to imagine anymore. This 1913 K-2 is literally a “time capsule” from that era. Features include maroon-red finish, spruce top, birch back and sides, mahogany 3-piece neck with ebony center stripe, Tamatave ebony fingerboard, Handle inlaid tuners, abalone fleur-de-lis, mother of pearl “The Gibson”, original pick guard, bridge, tailpiece, even frets and end pin; original purple-plush-lined hardshell case also in excellent original condition, and yes, original “The Gibson” monel-wound strings. Just a word about these strings: We are blown away by the tight windings and buzz free performance, even though they are over 100 years old. We would love to see a modern string maker study them and create a reproduction. This ‘cello was chosen by Chris Thile over other ‘cellos (including a K-4) when he visited our shop because of the unusually rich sound. In our opinion, this is the closest thing to opening a century-old time-capsule mando-cello that you will ever find. The only thing we cannot guarantee is the 1915 price tag and the train station delivery. $5500.